The Pocket Theater’s Two Man Tempest, though ambitious, fails to take the viewer by storm. 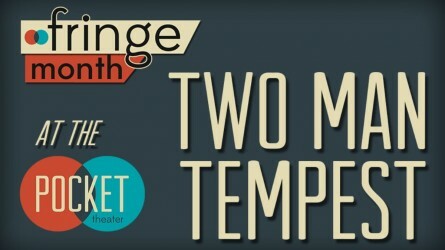 Two Man Tempest parodies Shakespeare’s classic story of magic, romance, and revenge. The 45-minute show, performed by Kendall Uyeji, Danny Lacker, and audience volunteers, is clearly the result of a lot of hard work. It features several rapid costume changes, puppetry, rap, and water guns, and leaves the actors visibly drenched in sweat before the end of Act 2. Despite the effort, these technical elements do little to make the show enjoyable. The script doesn’t pick up the slack. The jokes are weak, and they aren’t helped by the actors’ delivery or inability to stay in character. Part of the reason the show doesn’t connect with the audience may be because writer, director, and lead actor Uyeji doesn’t seem to have a deep connection with its source material. At the top of the show he tells the audience that The Tempest is simply “not a good play,” and that he doesn’t understand it or why Shakespeare wrote it. He claims that Two Man Tempest “tries to explore” Shakespeare’s story, but it does not seem to try very hard. The Trinculo and Stephano scenes and two of Prospero’s monologues are performed unabridged. I’d bet banishment to a desert island that these were the only parts of the play Uyeji would say he likes. The rest of the play is summarized with heavy reliance on the gimmicks I previously discussed. The rap summary of Act 3 is so consumed with how technically excellent it skips over telling the audience what characters are in the third act of the Tempest. For a show that is such hard work to perform, Two Man Tempest’s writing is surprisingly lazy. I’m not sure who Two Man Tempest is supposed to be for. The majority of the audience when I saw it were clearly friends and family of the performers, which gave it the atmosphere of a talent show, but it must be meant for a broader audience, given that it is performed at the Pocket rather than someone’s backyard. I guess it could be for people who know a lot about, but dislike, The Tempest. If you fall into this category, I thoroughly recommend Two Man Tempest. If not, wait for the next Shakespeare parody in town. Two Man Tempest by Kendall Uyeji. The Pocket Theater, 8312 Greenwood Ave N. 98103. Oct 1 – Oct 7, 7:00 and 8:30 p.m, as part of Fringe Month. Tickets: http://thepocket.org/see/. Info: thepocket.org or 206-257-5658.